A strong earthquake struck today (13th) morning off the coast of southern Sumatra in Indonesia, causing residents to panich and run awary from their homes but no major damage has been reported. The U.S. Geological Survey said the quake had a magnitude of 6.4 and occurred at a depth of 35 kilometers (21 miles). Trade unions are planning a united struggle if the promises made to them by President Maithripala Sirisesna are not honoured says Convener of the Petroleum Joint Union Alliance D.J. Rajakaruna. He said they have already had discussions with trade unions of Ceylon Electricity Board, Water Board, Ports Authority and of several other sectors. He said trade unions have not asked for any salary increase or other facilities but their struggle is to protect the assets of the people from being sold to foreign companies. The three demands they have put forward include bunkering operations at the Hambantota Port to be given to the Ceylon Petroleum Corporation, the Trincomalee Port oil tanks to be entrusted to the CPC exclusively and Sapugaskanda refinery refurbishment project to be fast tracked. Mr Rajakaruna said the entire country will be brought to a grinding halt as electricity and water supply would be cut off and there will be no operations at all the ports. He said the President had ensured that all three demands would be met when he met them on the last occasion. FCID to be close down soon? According to reports, the government is planning to close down Financial Crimes Investigation Division (FCID) soon and its staff will have to return to the CID and the Bribery Commission from which they have been seconded to the Division. According to a Senior FCID official, the officers who have been seconded to the FCID are highly skilled in investigating serious financial crimes and their expertise would not be fully used once the FCID is dismantled. He said the FCID is making a great effort to complete 62 high profile financial corruption cases before they have to abandon the task they have been assigned to. According to this official files on many completed investigations have been sent to the Attorney General’s Department but no action has been taken. The ‘yahapalana’ government that came to power promising to investigate frauds and corruption of the Rajapaksa regime formed the FCID on 26th February 2015. However, the ‘yahapalana’ government is now accused of protecting fraudsters and the corrupt and the bid to close down the FCID is to protect fraudsters of the previous regime, as well as those of the present government, say political analysts. 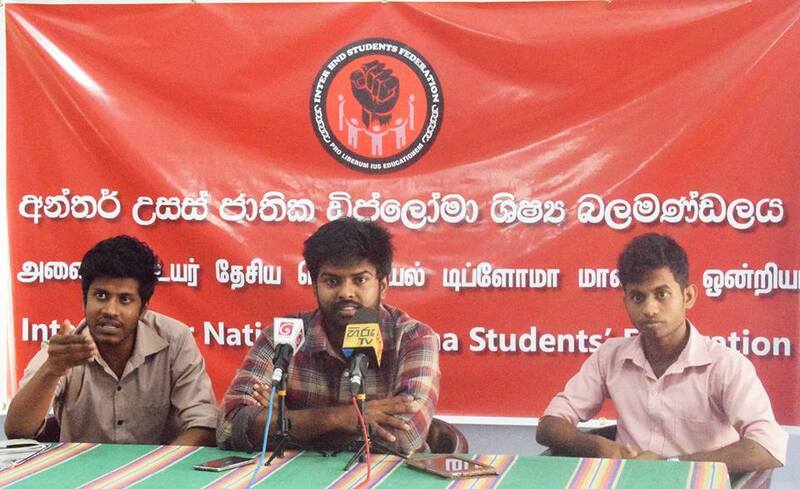 As no solutions for the issues presented institutionally to the government in relation to the Sri Lanka Higher Diploma Institutions system that was established in 1995 have been received students formed the ‘Inter Higher National Diploma Students’ Federation’ stated the Federation at a press conference held recently. The convener of the Federation Shehan said students in all Sri Lanka Higher Diploma Institutions would engage in a united struggle to get solutions for the issues they are confronted with at present. He said authorities have arbitrarily suspended students from attending classes, refrained from increasing ‘Mahapola’ grant and have not provided necessary facilities for their education.